The Big-Belly Seahorse is often referred to as the Pot Belly Seahorse. Many people are fascinated with the detailed look of this species. As a result it is one that is often part of the pet trade. However, they are very hard to keep alive due to them needing the right temperature, amount of food, and surroundings to do well. 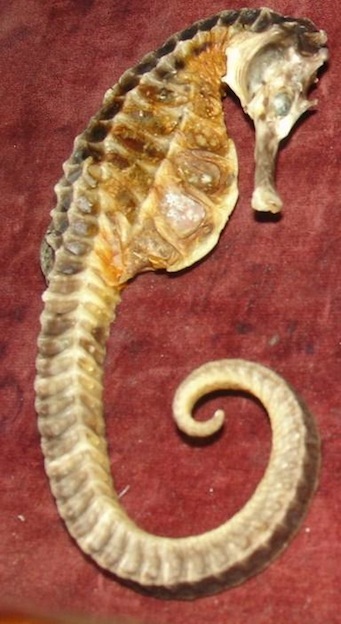 The overall body design of the Big-Belly Seahorse makes them one that the Chinese often use for making herbs and medicines. Millions of these seahorses are used annually for such purposes. They are also used to make jewelry and various forms of art. Commercial fishing for them continues to grow and that is putting the number of them in the wild at risk. This is one of the largest types of seahorses in the world, as they average about 12 inches in length. They have a head with a snout that tips forward more so than other species. They also have a belly that is very wide and round. The tail is coiled and it is also prehensile. The males feature smooth areas on the abdomen and the females have a pointed region here. The difference is due to the fact that the males are going to use that pouch for carrying the eggs until the young are born. The males also feature a longer tail and a snout that is wider than the females. The coastal areas of New Zealand and Australia are where you will find this species of seahorse living. They tend to stay close to large rocks, around coral reefs, and close to the seaweed that drifts around their natural habitat. They live in areas of water that range in temperature from 70 degrees to 80 degrees Fahrenheit. They can live in warmer waters but they don’t fair well at all if it is cooler. Big-belly seahorse – Hippocampus abdominalis / Photo taken by Zureks. The prehensile tail allows them to coil around anything they can. This is crucial to their survival as they can’t move very fast. They also can’t do well in water that moves quickly. When there are changes such as heavy storms large numbers of the Big-Belly Seahorse are found dead. This is due to the fact that they try to keep up with the movement of the water. They simply get too exhausted and then they end up dying. Changes to the overall environment in Earth have resulted in some huge storms wiping out large numbers of these seahorses in various locations. They feed on a variety of small crustaceans that are mainly found around the sea weed. They use their snout to be able to take in food and to swallow it in one piece. They can’t consume food that is larger than their snout. This is why it is a big part of the body and one that may look too large for them when they are young. Before the Big-Belly Seahorse will take part in mating they are going to engage in various rituals. This allows them to get their movements to be one and the same. A variety of color changes and head movements often occur during the courtship rituals. It will take several days for actual mating to begin. When that does happen the female will deposit eggs from her body into the pouch on the male. As many as 700 eggs may be deposited during this period of time. When the young are born several weeks later they have to care for themselves. This is why so many of them do end up eaten in the first weeks of life by various predators.